Arlington County, in Virginia, is experiencing a population surge that's expected to continue for at least the next decade. 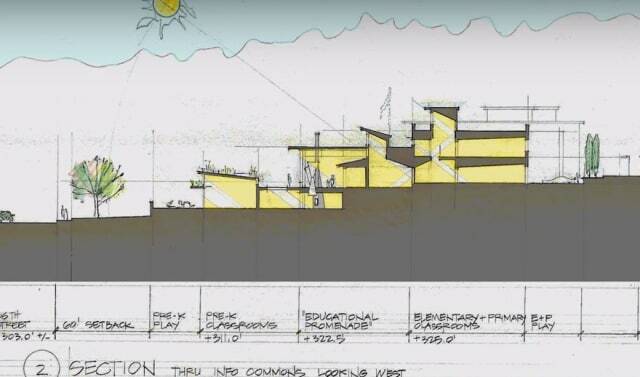 To accommodate the incoming families, a new elementary school was planned. Since they were starting with a blank slate, forward-thinking officials floated the idea of a net-zero energy building. Could it be done within the constraints of a public school budget? Any project that has three priorities usually ends up with two or more priorities conflicting, and Discovery School was no exception. It turned out that the most energy efficient design didn't meet all the educational needs - in this case, adequate daylighting and open spaces - so that option was scrapped. It's a school, so educational needs outweigh the others, as it should be everywhere. The selected site had a significant slope, which made the property undesirable for a building. But the architects said "Challenge accepted!" and designed a three-tiered structure that takes advantage of the landscape by providing ample daylighting and room for solar panels on the top of every level. Natural daylight not only provides free illumination, it also promotes good health and productivity. Sunlight causes the body to produce Vitamin D, which helps alleviate Seasonal Affective Disorder. Also, our bodies have evolved to interpret midday sunlight as a sign to be alert, so natural daylighting helps students to pay attention. LED lights tuned to the "cool" end of the spectrum supplement the natural light. Comfort levels also affect learning, and if you've been in a large building that has a central HVAC system, then you know that some rooms are too hot, others too cold, and if you're lucky, a few hit the "Goldilocks Zone." It turns out that a school is the perfect sized building for a geothermal heating and cooling system, also known as a ground-source heat pump. But rather than one large geothermal field and massive heat pump, the engineers designed an HVAC system that uses 130 geothermal wells with several smaller heat pumps to control different parts of the building. Instead of a few rooms reaching the optimal temperature, every room is adequately heated or cooled. That's also an energy-saving feature, as rooms that are unused at the time don't need heating or cooling. Proper lighting? Check. Comfortable temperature? Check. What else? How about the building itself serving as a living laboratory in which lessons can be integrated? 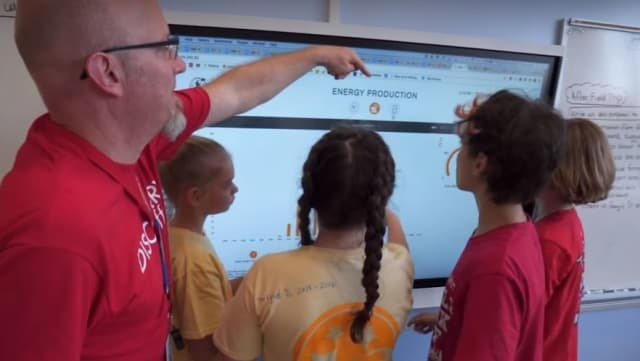 Discovery's classrooms are outfitted with smart whiteboards that function as any other smartboard, but with access to the school's energy dashboard. Students can see how much power the solar array generates during various times of day and can track its total energy production. They can also see how much energy is being consumed and compare the energy generated, energy used, and the grid energy that's purchased and sold. In addition to the 1710 photovoltaic panels that provide most of the school's electricity, there are a couple of dedicated panels on a rooftop laboratory, where students can see how PV panels perform with different tilt angles and various shading conditions. The initial plan was just to make the school energy-efficient; the half-megawatt solar array was added as an afterthought, but it made fiscal sense. Constructing a new building comes from a bond, where operating expenses (like utility bills) come from property taxes. (Yes, I know that property taxes ultimately pay for the bond, but once the loan is paid off, those revenues can be put toward education instead of energy bills.) In fact, the building's features, including the rooftop photovoltaics, save the district $101k every year in avoided utility costs. Officials estimate a 13-year payback period for the solar array. 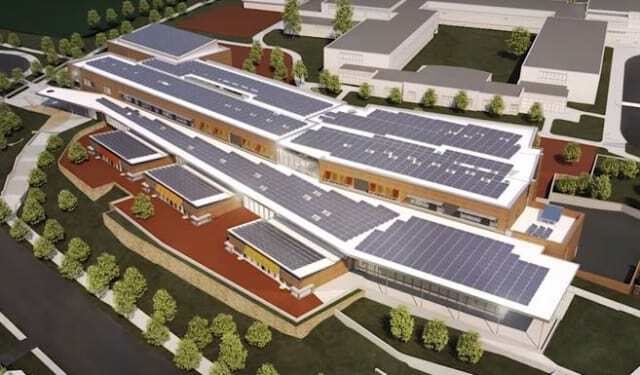 The school's price tag was just 2% higher than the cost other facilities of comparable size in that area, proving that it doesn't cost much more to make a net-zero energy building. Energy-efficient structures begin with a tight, well-insulated building envelope. Discovery's outer walls are made of eight-inch-thick concrete forms with four inches of polystyrene insulation. The concrete's high thermal mass helps to regulate temperatures, and the insulated forms reduce heat loss caused by leakage and conduction. 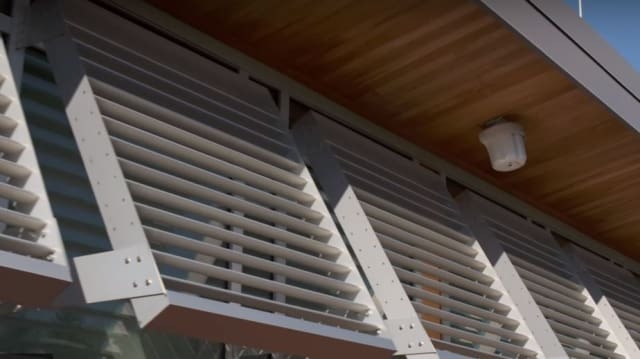 Slats over the south-facing windows reduce the solar gain from the high summer sun while allowing the low winter sun to reach the double-paned glass and provide passive heating. Once the architects crafted a building that would consume the least amount of energy possible, engineers designed a 496 kW photovoltaic array to generate its electricity. The 1710-panel grid-tied array covers all three tiers of the rooftop. Architects avoided the roof when placing the HVAC and other mechanicals, to eliminate shadows and ensure maximum PV coverage. 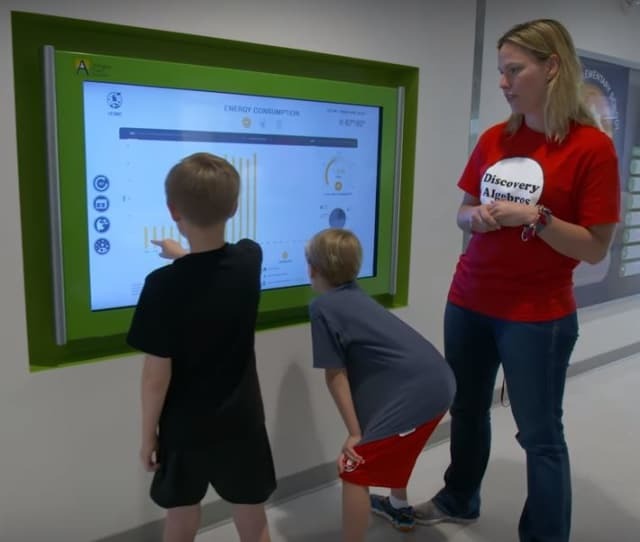 The Discovery Elementary School building performs even better than its net-zero goal; in 2016 its solar array generated 18.5 MWh more energy than the facility used. In addition to energy conservation and on-site generation, Discovery Elementary School also cuts the amount of material going into the waste stream. Many of the facility's decorations were created by students, using recycled materials as their art supplies. Recycling bins collect all kinds of refuse to be properly processed; older students even developed lessons to teach their younger schoolmates about recycling and sustainability. Overall, the building outperformed its design model, achieving an energy use intensity (EUI) of 16k BTU per square foot per year; that's 76% more efficient than the average US school of comparable size. Of course, that's just a single data point. Its EUI will be slightly worse in years that have colder winters, so the overall average for the school will probably be close to the design model's predictions. One school board member said that the building was designed not for yesterday's students, but for the students of the future. Discovery Elementary School is not just a building, it's a holistic philosophy of sustainability. That's a future worth discovering.